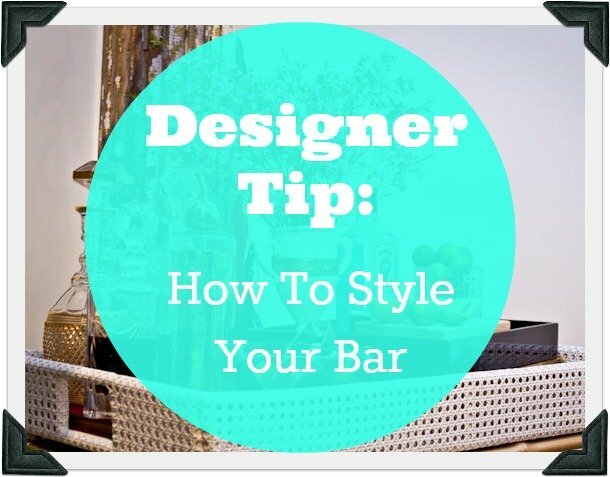 Designer Tip: How to Style Your Bar | Havenly's Blog! 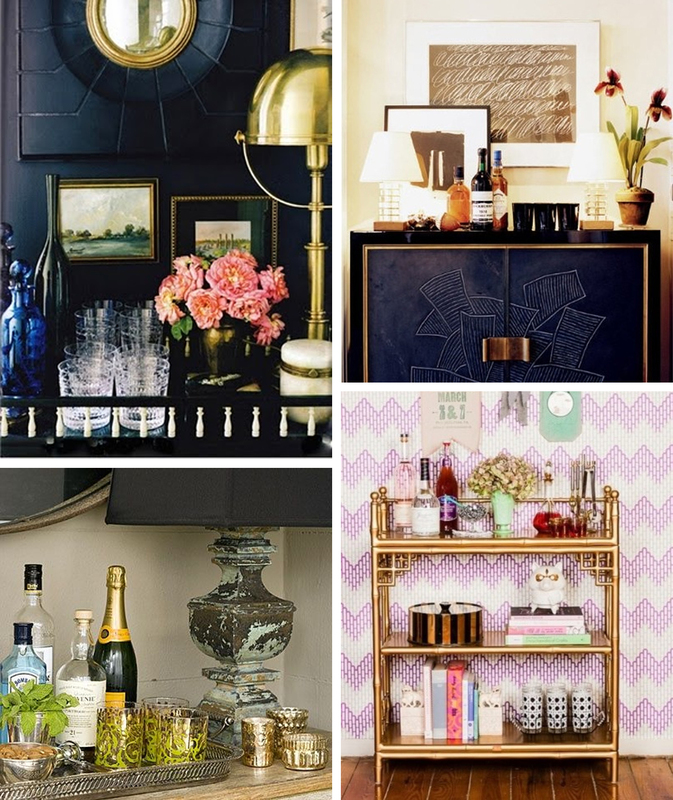 Along with the rest of the blogosphere, we just love a well-styled bar. Do prettier home accessories exist for any other part of the home? Maybe– but we never tire of cocktail napkins, girly glassware, and shapely glass bottles in all different sizes and hues. Something about a well-styled bar just screams “I have it together, people!” even if you don’t. Your secret is safe with us. Mix your most beautiful bottles of booze with non-alcoholic decor. 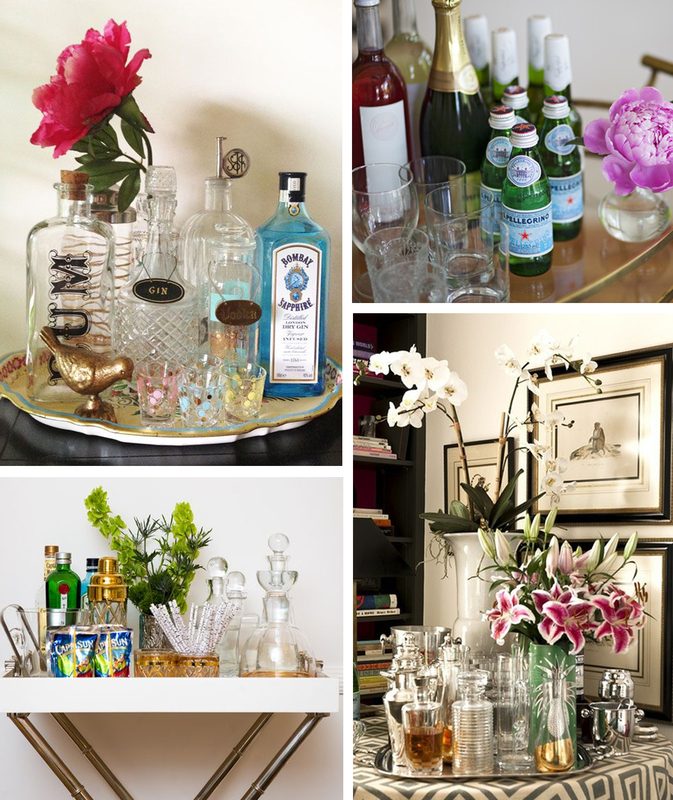 Fresh flowers, small lamps, artwork, trays, and glassware are all great ways to add style to a bar. It’s also important to edit and curate your bar area so that every bottle you might own is not on display (we know it’s hard– try to show some restraint!). Nobody needs to see your stock of Popov and Georgi bottles. Speaking of Popov and Geogi, keep anything that comes in a plastic bottle hidden (like, under your bed). Only display your best looking liquor, or pour the contents of not-so-pretty bottles into decanters. Displaying sparkling water like San Pellegrino along with your booze also makes it appear as if your drinking habit is under control (even if you only use that sparkling water as a mixer). Don’t forget the details! Bar accessories like ice buckets, wine chillers, shakers, stirrers, straws, wine stoppers, and bottle openers can be beautiful too! Keep smaller accessories in a decorative bowl and display pretty straws in a glass. Garnishes and lemons or limes are also a great way to add a pop of color to a bar cart or tray. What is more charming than mint in a silver julep cup? Our lovely little thrifted bar cart needs some serious styling (we’ve got the alcohol down, and that’s about it!). We’ll share pictures of it along with the rest of our dining alcove very soon. Some of our favorite bar styling guides we refer to in times of need are…. 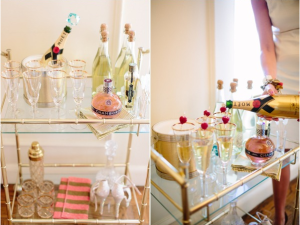 The Skinny Confidential – We just want to hang out with this model/bloggerina (and not just bc of her adorable skinny bar cart)! 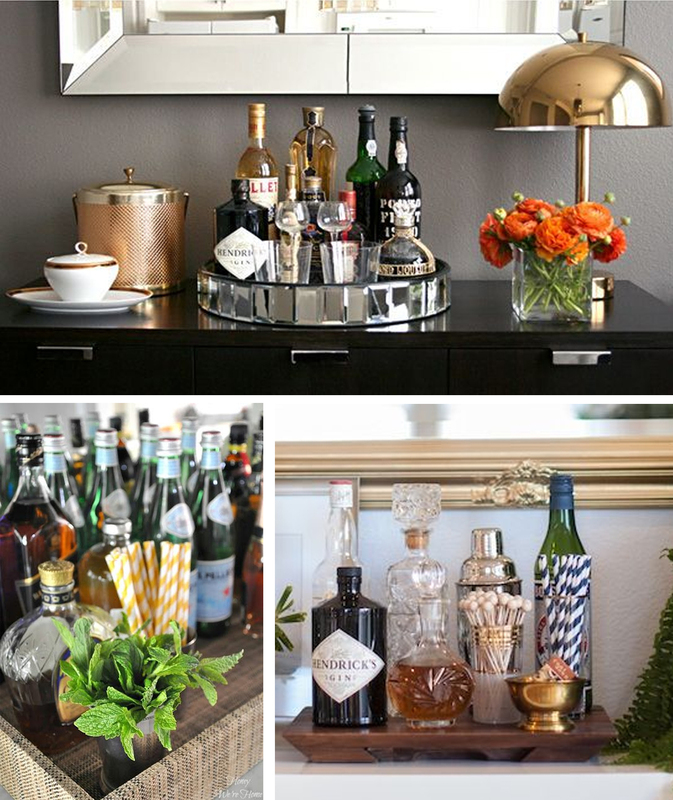 The amazing Maggie Kellogg Rye of Waiting On Martha, whose Bar Cart Styling Guide via Camille Styles is all you need to get your bar guest-ready! You can even purchase a number of her little bar beauties from the Waiting for Martha Shop / wouldn’t your boozy bottles look so much prettier with these little lovelies adorning the tops? Finally, Aaron Hartselle of Aaron Hartselle Creative (Event Planning + Design + Styling) teaches us his tricks via Style Me Pretty Living. 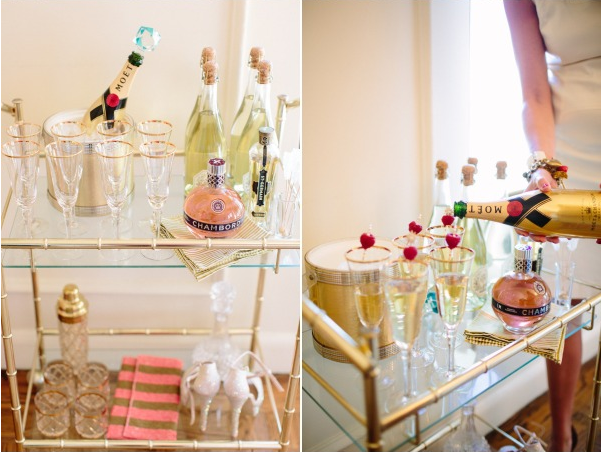 Are those high heels on a bar cart, I see? He even gives you specifics for pretty/practical liquors to stock up on. Never get tired of this one– thank you, Aaron! Are you struggling to find the perfect vessel/accessories for your bar? Get yourself paired with a Havenly designer and you’ll be on the fast track to perfection.